THE BEADY EYE: SAY’S MRS MAY IS NOW THE LEADER OF A NEW TERRORIST GROUP: THE TORY/ DUP COALITION. The idea that the DUP IS NOW IN POWER in Westminster WITH MRS TERRORIST MAY should worry us all. With strong historical links with Loyalist paramilitary groups Mrs May AND HER new-found friends SHOULD BE ON THE TOP OF THE ENGLISH TERRORIST SUSPECTS LIST. Specifically, the terrorist group Ulster Resistance was founded by a collection of people who went on to be prominent DUP politicians. Peter Robinson, for example, who was DUP leader and Northern Ireland’s first minister until last year, was an active member of Ulster Resistance. One of the things the group did was collaborate with other terrorist organisations such as the Ulster Volunteer Force to smuggle arms into the UK, including RPG rocket launchers. 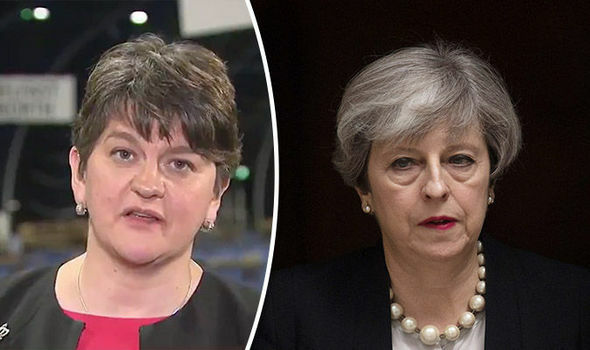 The Tories to end an election campaign which they spent attacking Corbyn for his alleged links to former Northern Irish terrorists by going into coalition with a party founded by former Northern Irish terrorists is a deep irony. They are climate change deniers, using their role in government in Northern Ireland to set up a subsidy scheme for biofuels, which gave those who bought into it more money than they had to pay out. The Northern Irish exchequer ended up paying out around half a billion pounds to those who knew about the scheme, leading to a scandal known as ‘cash for ash’, and a major investigation into whether DUP staff and supporters personally benefitted. They have fought to stop equal marriage, making Northern Ireland the only part of this archipelago without equal relationship rights. We don’t know what the DUP will demand from the Tories in exchange for supporting them but if the Queen had any decency she would have shown the door of Buckingham palace to Mrs May and her new friends before she sells arms to the IRA. THE REVERENT Ian Paisley must be chuckling in his grave.